Warlord Games is bringing a new Rick Priestley miniatures game to your tabletops tomorrow. It's called Lords of Erehwon (yes, that is "Nowhere" spelled backwards). The game's sort of a bit between skirmish and massed army, with maybe 2 dozen figures out on the field for each army, formed into loose units. 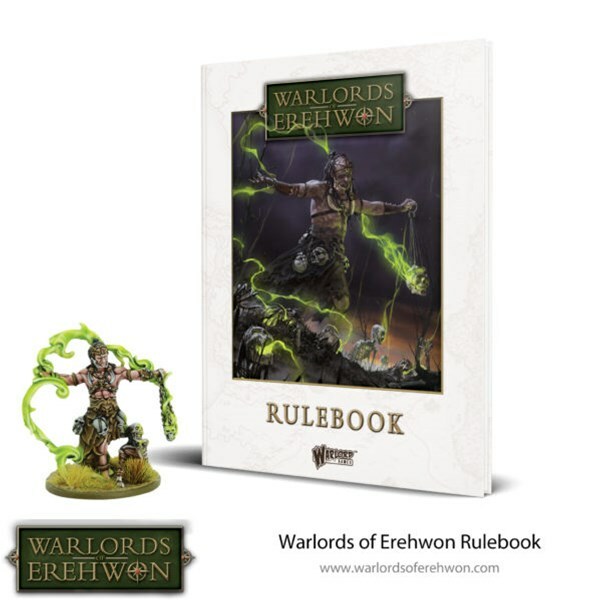 Pre-orders for the rulebook start tomorrow. Warlords of Erehwon transports us to the multifarious fantasy realms of fiction, folklore and myth, placing us at the head of a fighting force of our choosing. Model warbands clash across fantastical tabletops as humans and monsters, the living and the dead, war over the spoils of victory in a universe of heroes, sorcerers and the supernatural. Our game has been designed with a single objective in mind – to allow us to play fast-paced and exciting miniature battles on a 6×4′ table between rival warbands. A warband represents your own band of warriors – courageous humans, blood-thirsty monsters, perhaps even minions that you have raised from beyond the grave to do your bidding.